“Brian Sullivan was born on 9 August, 1912 in Oakland, California. He was an actor, known for Cavalcade of Stars (1949), The Ed Sullivan Show (1948) and Musical Comedy Time (1950). A versatile, boyishly good-looking (in his younger days) tenor, he came from Broadway to spend fourteen seasons with the Metropolitan Opera, beginning with the title role in Benjamin Britten's PETER GRIMES in 1948. 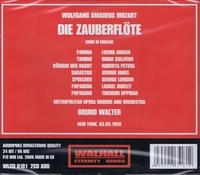 Other frequent roles with the company included Alfred in Johann Strauss II's DIE FLEDERMAUS, Tamino in Mozart's ZAUBERFLÖTE, Grigori in Mussorgsky's BORIS GODUNOV, and the title role in Wagner's LOHENGRIN. From what I can glean from the Internet and The Met Archives, Brian Sullivan sang in 162 performances at The Met, including his first performance as Peter Grimes 23 Feb., 1948, and ending with Alceste in 1961. He enjoyed an active career in the United States and Europe. "Miss Amara is another of those American singers whose longevity astounds the opera chronicler….In her case, the record is particularly impressive. Probably more than any major soprano of the last fifty years, she was the classic house soprano, taking on an amazing variety of roles and maintaining in them a level of vocalism that demands respect….Her Pamina is a representative early career effort…." "The American bass Jerome Hines had a long and distinguished career at the Metropolitan Opera singing a wide variety of roles with true consistency of voice and style. He appeared with the company for more than 40 years from 1946. An imposing figure - he was 6ft 6in tall - he had a voluminous bass to match his stature. His charismatic presence made him ideal for the many roles demanding a big personality. It was thus hardly surprising that Sarastro in THE MAGIC FLUTE, Gounod's Mephistopheles, the high priest Ramfis in AIDA, the Grand Inquisitor in DON CARLOS, Boris Godunov, and King Mark in TRISTAN UND ISOLDE were among his leading roles. Although always faithful to the Met, Hines made many forays abroad. In 1953, he undertook Nick Shadow, with Glyndebourne, at the Edinburgh festival, in the first British performances of Stravinsky's THE RAKE'S PROGRESS. That led to engagements in leading houses in Europe and south America, and eventually to Bayreuth, where he sang Gurnemanz, King Mark and Wotan (1958-63). In 1958, he made his La Scala debut in the title part of Handel's HERCULES, and, in 1961, he first appeared at the San Carlo in Naples, in the title role of Boito's MEFISTOFELE. His Boris Godunov, at the Bolshoi in Moscow in 1962, was, by all accounts, a deeply impressive portrayal. He was fortunate to arrive at the Met just as the opera house was in need of replacements for the great Ezio Pinza, who had decided to appear in SOUTH PACIFIC. Unlike his distinguished predecessor, Hines could also sing the German and Russian repertory, in addition to Italian and French. In all, his innate musicianship stood him in good stead. Most of his discs derived from live performances. They reveal a sterling voice, a refined style, consisting of a burnished tone, a fine line and exemplary diction, although he never seems to have have been a very profound interpreter. Hines was both a deeply religious person and a good writer. He combined these qualities in his own opera, I AM THE WAY, a work about Jesus, performed, with Hines as the protagonist, at Philadelphia in 1969. The previous year, he had published his autobiography, THIS IS MY STORY, THIS IS MY SONG, but his most lasting volume was GREAT SINGERS ON GREAT SINGING (1982), in which he made discerning comments on the art of many colleagues. Hines' later appearances befitted his advancing years: he was Arkel, the elderly grandfather in PELLEAS ET MELISANDE (Rome, 1984), and the blind father in Mascagni's IRIS (Newark, 1989). His last stage appearance was as Sarastro, in New Orleans in 1998, when he was 77."